This interview is part of SciFi Month, hosted by Rinn Reads. Many of you have a smile on your face right now, because it’s always Sci Fi Month here at Little Red Reviewer (and fantasy month, and new weird month, and all-sorts-of-speculative-fiction month). Today I’m thrilled to interview Gareth L. Powell, who is best known for his Ack Ack Macaque books. I’ve seen these books at the local bookstore, and every time I do a double take. is that really a gun toting monkey? why yes, yes it is. Mr. Powell was kind enough to answer my questions, so let’s get to the interview! Q. Please introduce yourself, and tell us a little about your Ack-Ack Macaque series. A fighter pilot who is a cynical monkey? This I gotta know more about! A. I am the author of four novels – Hive Monkey, Ack-Ack Macaque, The Recollection and Silversands – and the short fiction collection, The Last Reef and Other Stories. I am currently writing my fifth novel, Macaque Attack, which should be out in January 2015. 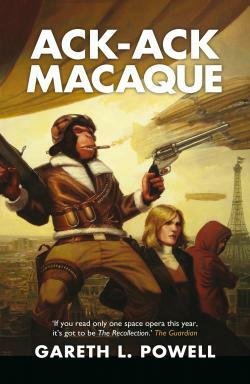 Ack-Ack Macaque and Hive Monkey are the first two thirds of my ‘Macaque’ trilogy, dealing with the exploits of Ack-Ack Macaque, a technologically upgraded monkey who drinks, smokes and swears, and thinks he’s a World War II flying ace. The books are a mixture of murder mystery, thriller, and alternate history cyberpunk.